There's nothing more exciting than taking something that looks old and tattered and remaking it into a brand-new item. 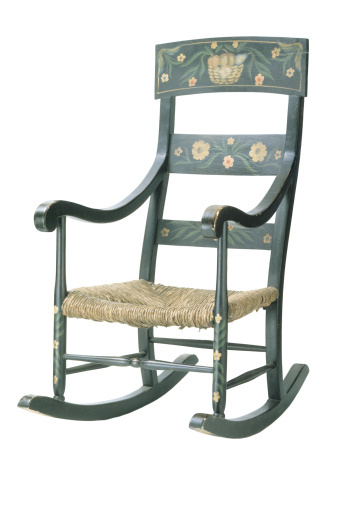 This article explores remaking a chair by weaving a seat out of inch-wide canvas trim. Notice there are four bars at the same height at the seat area. Take off the old seat completely. 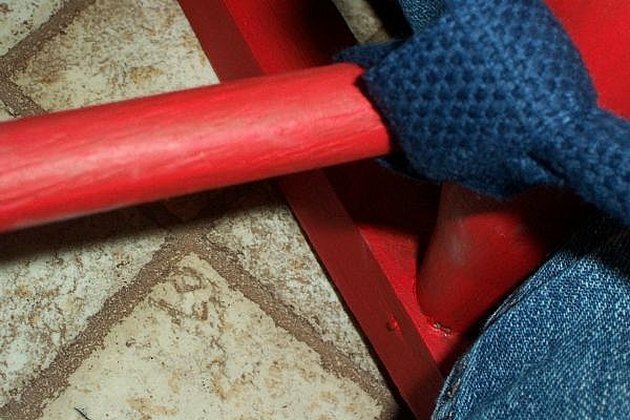 Make sure that there are strong crossbars on the sides and front and back of seat to make a square right at the seat base. This method requires four bars. 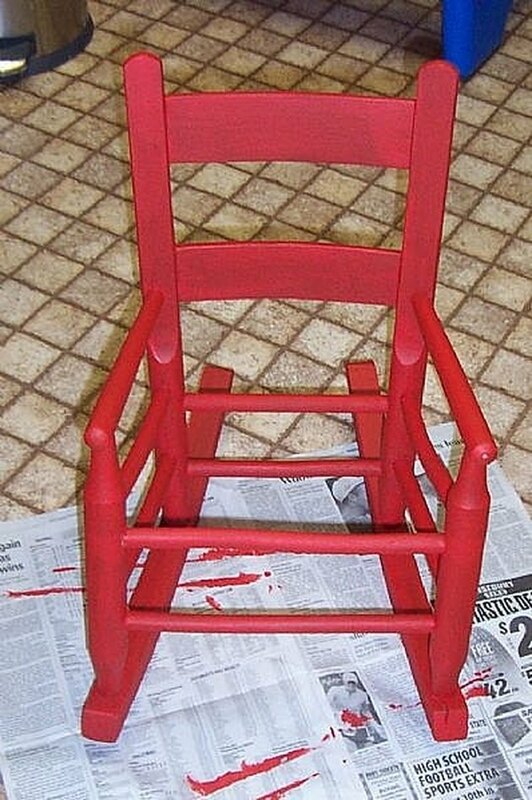 If there is any painting or anything else you need to do to the chair, do it now. 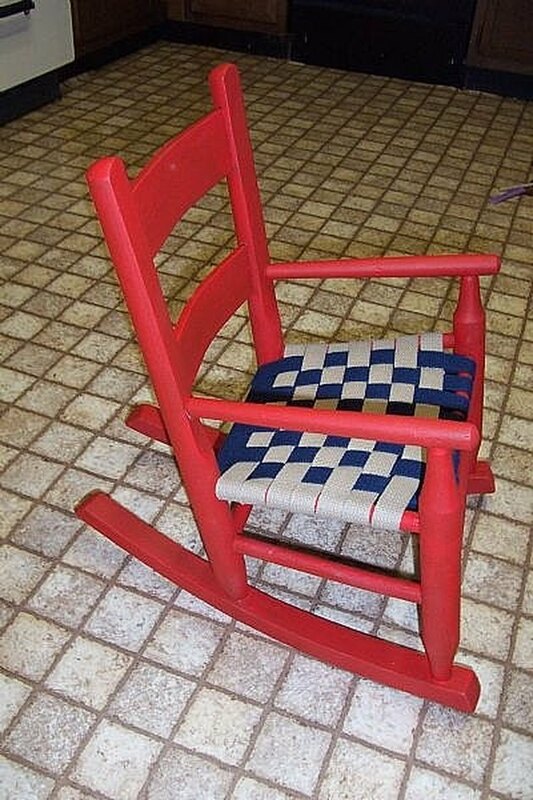 The chair I did was a child's rocking chair. The canvas trim I bought is about one inch wide. Because the chair is approx. 12 inches wide by 12 inches deep I figured it would take about 14 feet to cover each direction of the weaving, so I bought 5 yards each of two different colors (depending on how big the chair is of course). 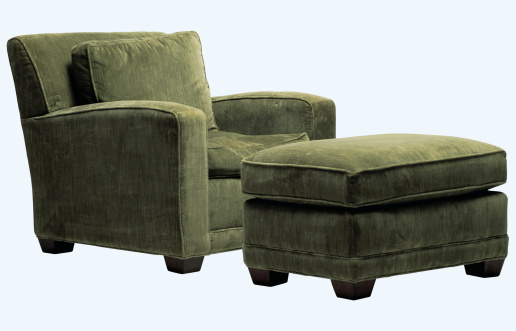 Measure your chair's width and length of the seat. Since the trim is one inch wide, multiply the two numbers together and that gives you the number of inches of trim you need. Add a yard in each direction in case extra is needed. Anchor the first color to the back rail of the chair and sew it on there. Then wrap it around the front rail and back to the back rail. 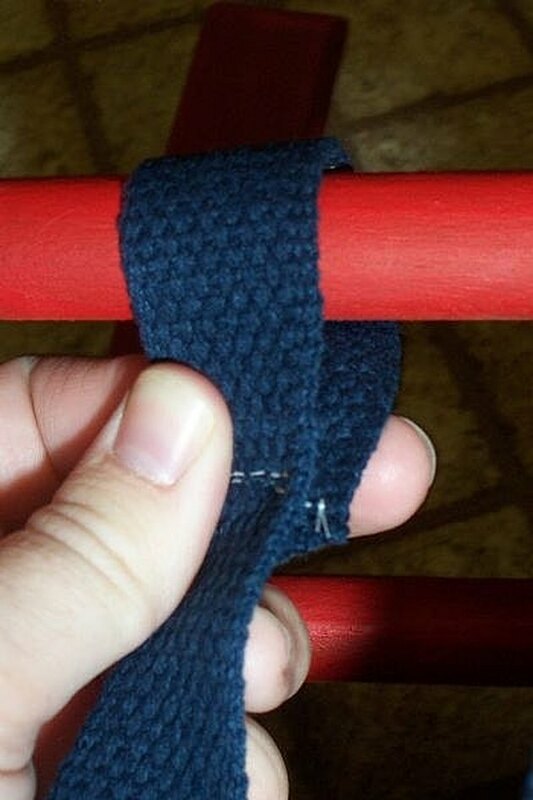 You will make two layers of the trim, one on top of the chair and one below. It's just like you're wrapping a roll of something except around two bars instead of one. Like the tread on a tank. The rails on this chair are two different widths so on one rail the trim is covering the whole bar, where in the front it's spaced a little farther apart. After wrapping the rails, Tie off the other end to a lower rail rather than sewing it in case you mess up and have to take it back off. 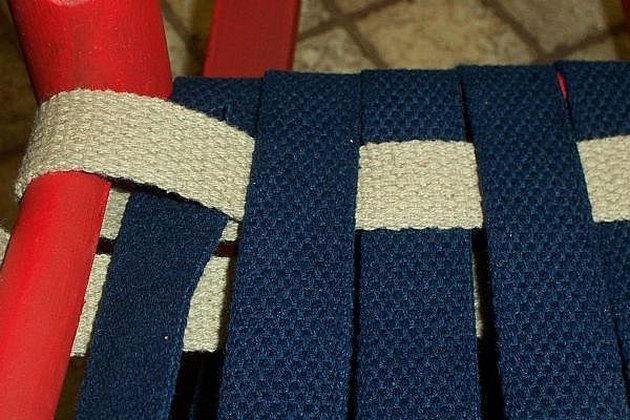 Once you've got the first color wound around the chair, start weaving the second color through. I started at the back left and sewed the end on. Then you weave over, under, etc till you get to the other side. At this point as you start coming back, you'll be weaving on the underside of the layers the same way as the top. You see there are two layers of canvas. One on the top of the bar and one underneath. It's more durable that way. Weave back to the left on the bottom, then come and do the second row on the top. Once again, anchoring the end. 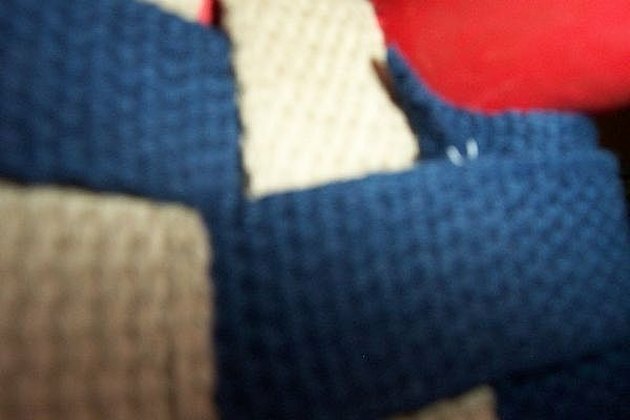 I hid all my end stitches under other weaving. 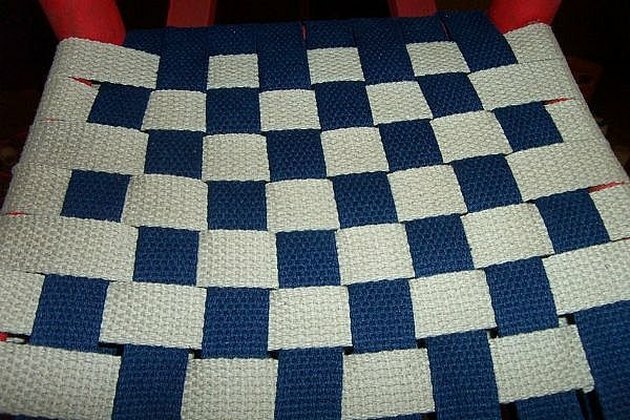 The finished seat should have a nice checkerboard pattern if you used two colors.